The New Stratos, right, alongside the 1970s car. MILAN -- The Lancia Stratos rally car is being revived by Italy's Manifattura Automobili Torino (MAT) as a 500,000 euros ($617,000) sports car offering a performance of up to 600 hp. 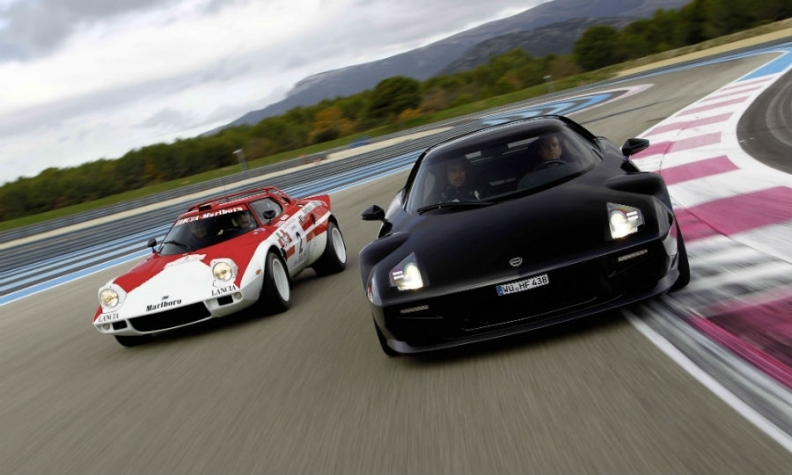 MAT will build a limited series of up to 25 units of the New Stratos. The car will be unveiled at the Geneva auto show on March 6. The New Stratos' design follows the lines of its predecessor, one of the most successful rally cars. The Lancia Stratos, designed by Bertone, was launched in 1972 and won the World Rally Championship in 1974, 1975 and 1976. MAT CEO Paolo Garella said the Stratos models will be modified Ferrari 430 Scuderia cars, which customers will have to buy on the used-car market. MAT will carry out modifications including shortening the 2600mm wheelbase by 200mm. The car will also have a shorter front-end and a different positioning of the radiator. The New Stratos will be powered by a 4.3-liter, eight-cylinder with horsepower increased to 540 hp from 510hp of the original 430 Scuderia after air intake and exhaust modifications. The engine is coupled with a six-speed sequential gearbox. The engine's power can be boosted to 600 hp with mechanical and control unit modifications. MAT has a dozen customers already for the car, whose conversion price starts at 500,000 euros, with the cost increasing depending on the number of options. The New Stratos project was originally commissioned in 2010 from Pininfarina by billionaire Michael Stoschek, who is chairman of the Brose Group, a German supplier that ranks No. 36 in the Automotive News Guide to the top 100 auto industry suppliers. Stoschek, the grandson of Brose's founder Max Brose, is a rally enthusiast. A single example was built in 2010 on the base of a 430 Scuderia but the project did not go further after objections from Ferrari. Garella worked on the earlier Stratos program while he was Pininfarina's special projects head. MAT obtained permission from Stoschek and his son Maximilian to replicate the New Stratos using the design and technologies of their car. MAT will also show in Geneva renderings of GT racer and Safari versions. Lancia built about 500 units of the Stratos. Ferrari produced 1,200 units of the 430 Scuderia from 2007 to 2009.